How can you know who is downloading your images and from where? How can you control who downloads your images in the first place? Do private registries on Docker Hub give you the fine-grained access control that you really need? Docker Hub only supports Docker images. Does it make sense to use a different solution to distribute packages from other software technologies you work with? Bintray is JFrog’s universal distribution platform, and fills all of those gaps between what Docker Hub provides and the distribution needs of an enterprise software development organization. Using Bintray as your download center for Docker images addresses these questions and presents several benefits. Organizations and Teams offered by both Bintray and Docker Hub are a great way to control how users within your organization access your private repositories. But when you want to distribute your images outside of your organization, you need a much greater degree of control. Bintray meets this need with download keys and entitlements. Download keys are password protected identifiers which you can provide to anyone to whom you want to provide access to your private packages. To these download keys you attach entitlements which let you define access privileges to any entity that contains a file By assigning different entitlements to download keys you can provide external users with access to your packages at any level of granularity- from a complete repository down to a specific file within a repository path. This means that you can provide access to specific Docker images while denying access to others – even if they reside in the same repository. It’s not enough to know how many times your image has been downloaded. You want to know who downloaded it, from where and when. As a first layer of data, Bintray provides you with number of downloads over any period of time. This lets you monitor the popularity of files you upload to Bintray for distribution. But Bintray also provides detailed log files that show you additional information such as region, country, IP address and even the user and organization that downloaded each file. This information can be used to segment the population of people who are downloading your files for your marketing efforts. Bintray even provides live logs showing access to your repositories in real time so you can monitor activity within your resources as it happens..
Docker Hub works for distributing Docker images, but at the same time, most organizations will work with many other software packaging formats that Docker Hub does not support. All those other components must be managed with different infrastructures and APIs. Bintray is package-agnostic. You can upload and distribute anything enjoying the same rapid downloads, the same fine-grained access control and the same detailed stats and logs. In fact, Bintray supports the client APIs for Docker, Debian, RPMs and Maven and offers the most comprehensive repositories for Java components, RPMs and more. And with an extensive REST API, Bintray can be fully integrated into any continuous integration/continuous delivery ecosystem to support a fully automated software distribution pipeline. Once you’re on Bintray, you don’t need anything else. For Docker, container technology is a core competency; that’s what they do best (albeit, for Docker images only). Bintray serves over 200 million downloads per month of 200 thousand packages that reside in 50 thousand repositories. For Bintray, software distribution is a core competency. All of the development efforts on Bintray aim to continuously enrich and improve the services it provides as a download center; both in the free tier used for open source software and in premium tiers used for enterprise grade commercial and internal software distribution. Bintray matches Docker Hub in many aspects, including fast CDN downloads, rich REST API for automation, searchable metadata and more. 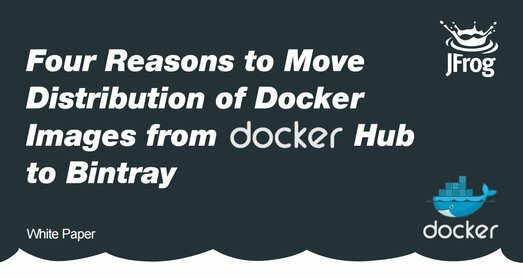 However, Bintray surpasses Docker Hub in key features that a software development organization needs from its download center, such as access control, monitoring of activity in repositories and support for additional software formats. But more importantly, software distribution is a core competency for the makers of Bintray, and as such, Bintray provides the most professional enterprise-grade download center in the cloud available today.